Yoga Nidra is the practice and art of Yogic Sleep. It is a profound but simple guided meditation practice accessible to everyone. The practice systematically guides the body, mind, and breath into a complete state of bliss. 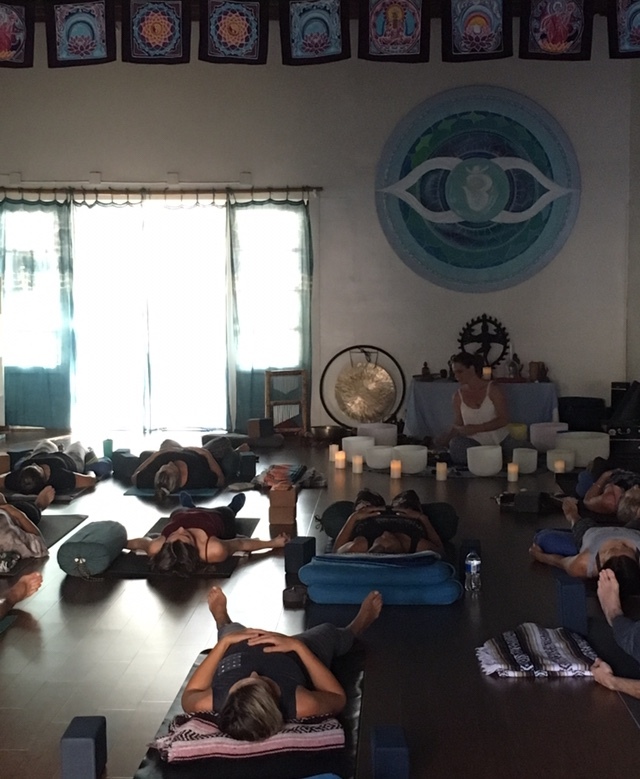 As you rest in a supported Savasana, Nancy will lead you through a guided relaxation that will invite your body and mind to enter into a deep state of rest. While in this safe, sacred space, Jeremy and Nancy will then create an improvised soundscape of healing vibrations using the handpan, didgeridoo, gong, and crystal singing bowls. You will leave tonight feeling very grounded with a deeper connection back to yourself and the world around you. Relax, restore, find your bliss, and please stay after and connect in community over a cup of tea. Everyone welcome, no prior yoga or meditation experience necessary. In order to keep this experience this more personal, class size is limited. Sign up early for a discount and to save your spot! Jeremy and Nancy are both from Michigan. They met in 2011 and began a journey around the world sharing their passion for yoga and sacred music. Their journey has taken them to 4 continents and 10 countries together, including India, Australia, Greece and more! They are both dedicated yoga students and teachers and live in the service of inspiring others to live from their hearts and follow their dreams. Together they lead their "Sound of Spirit" Yoga and Music retreats around the world. Black Sheep is super stoked and grateful to welcome them back to South O for their third sound healing concert at the studio. If you love our regularly scheduled sound healing classes, DO NOT MISS OUT ON THIS ONE! An experience like this does not come around So Cal very often.